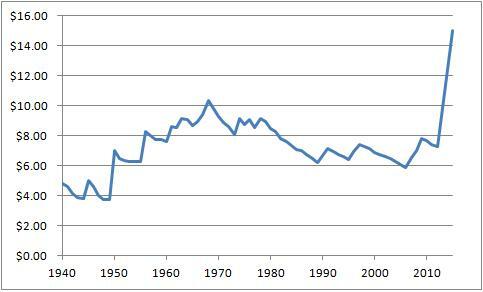 Does the 1968 Inflation-Adjust Minimum Wage Justify a $15/hr Minimum Wage Today? @StephenFleming $11/hour real wage seemed to work just fine in 1968. $14/hr is about right since real per capita GDP has doubled since then. Doing some basic statistics on this series, the mean minimum wage over this time was $7.09/hr, slightly lower than today’s $7.25/hr. The standard deviation is ~$1.60/hr. 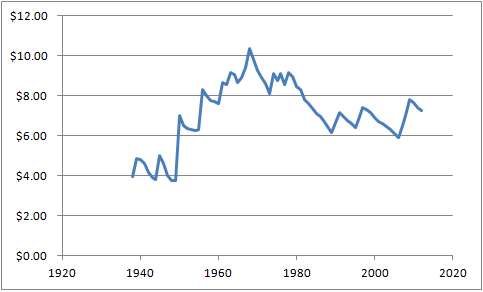 If you look at the trend though, the pre-WWII numbers look like outliers on the low end. What if we drop them? The new mean would be $7.62/hr (slightly higher than today’s minimum wage), but the new standard deviation would be $2.48/hr. That means that the 1968 minimum wage was actually 2.5 sigma above the mean minimum wage for the 1950-2012 timeframe–which is pretty obvious from looking at the chart. Is picking the data point that is the largest outlier from the mean over the past 60 years really a legitimate point to extrapolate from? More importantly, $15/hr would be 6.74 sigma above the mean for the past 60 years. Ignoring all of the other arguments for or against the minimum wage, can anyone seriously claim that being over six sigma over the mean is something where past experience can give us any confidence that this won’t cause serious problems? As I said, there may be other more legitimate arguments for increasing the minimum wage, even to $15/hr, but I don’t think the 1968 inflation adjusted minimum wage is a very strong argument when taken in context.